Ever since their inception in 2011 Bodies Race Company has remained committed to getting the community active and healthy by providing high-quality events with affordable pricing. You can count on every Bodies Race Company event to provide family fun activities, chip timing, live results, great event shirts, finisher medals for all participants, custom bibs and great post race food. Sign up today and come run with us! Fun. Family. Fitness. 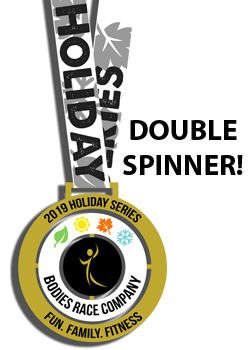 Kansas City’s favorite series is back for 2019 and this year we are excited to offer the Bodies Holiday Series in North Kansas City too! Join us for the East Bodies Holiday Series or the North Bodies Holiday Series (maybe even both! ), each series includes registration for eight great events surrounding your favorite holidays throughout the year. Our goal is to keep you healthy and active all year long at an affordable price for the whole family to participate which is why the series is the best price you will find all year! Sign up today to become one of our Holiday Series VIPs! Check out even more Bodies Race Company events! Bookmark this page to stay up to date on the latest Bodies Race Company – KC events! Traveling and going to miss one of our events? Want to run a half marathon in another state? Check out all of our other Bodies Race Company locations. Never miss another race, sign up today and run while you’re away!